Note: You can click here to see my evolutionary invention to produce awesome toum in 3 minutes. The article below is still worth a read so you gain an understanding of the toum making process. My brother Fady eats garlic sauce spread on Lebanese bread all on its own. He says that with garlic, you gain your health but loose your friends. 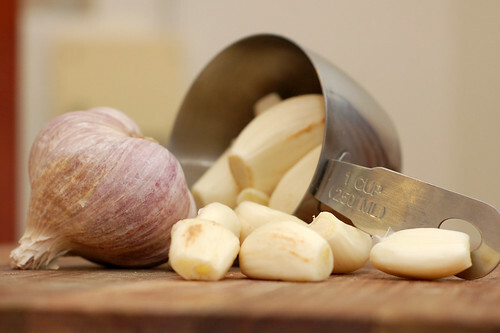 The consumption of garlic in Lebanon is, and historically has been in such copious quantities that the Lebanese can hardly claim any vampire of note. 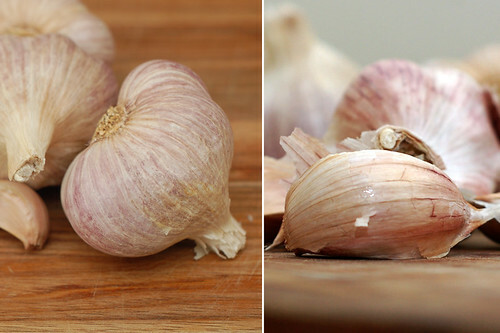 Where should I begin to explain what a pivotal role garlic plays in Lebanese cuisine? The relative of the onion has been consumed as a food and a medicine in the Mediterranean since the days of the pharaohs. It has been referred to in the Old Testament (Numbers 11:5) as one of the foods that were consumed in Egypt, alongside with melons, onions, cucumbers and leeks.. It is used in thousands of recipes and never a day goes by when it is not eaten. Mixed with lemon juice and olive oil, it is our most used salad dressing and meat or chicken marinade. The Lebanese word for garlic is toum, which is also how we refer to the fluffy white garlic sauce that is served in restaurants with roast chicken, chicken shawarma and shish tawook (chicken skewers). Its affinity with chicken is therefore evident, but it also goes beautifully with lamb, beef and goat meat. 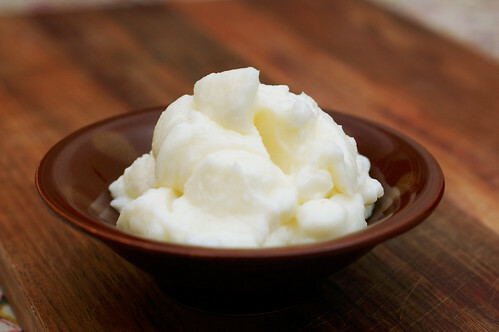 Making toum is actually easy, but you need a food processor, and lots of patience. Once you make this sauce, you might get addicted, so beware. Fouad, I had to quickly leave a very busy kitchen to write this and say thank you, thank you, thank you! I am a very good cook and can truthfully say nothing has ever “not come out”, except two things: Spanish tortilla, which I mastered last week, and toum, which I mastered just now! This is the first time, in 25 years, that I’ve managed to do it! 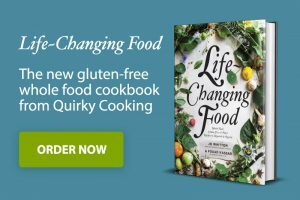 I tried every recipe, and even – I’m ashamed to admit this, because it really is the sure way to learn how to cook something – watched someone make it, to no avail. Your recipe has made me see what I’ve been doing wrong all these years: not alternating the oil and lemon juice, and not using enough garlic. All those recipes specifying 1-2 heads of garlic cannot possibly be taking the size of your standard heavy-duty food processor. So garlicky, thankful kisses from a very, very smug toum lover! Had been reading your foodblog..kinda interesting..actually really loved and missing the lebanese foods…chicken shwarma the lebanese style with cucumber pickle and garlic sauce or tahini….wow..never miss that if i go to the souk..
tell me how can i create a creamy sweet-sour taste garlic sauce..tht taste..yummy..is it the same like the recipe u share with us? Question: if it splits, do you just simply add an egg white to the recipe and will this turn out to be aioli? Most of the aioli recipes I’ve read require egg yolks. Also, will it work just as well if you roast the garlic first or this is a big no no? Roasting the garlic will change its flavour profile. that said, I havent tried it. I love the raw garlic flavour. As for the egg white, yes, sure, remove the liquid, add the egg, and then gradually add the liquid back in. Egg white will bind it, and there’s no need for the yolk. Thanks for the carefully-written recipe. I had used some other recipes and failed. This one worked perfectly. Other recipes do not usually mention the ‘step-by-step’ procedure; you mix all the ingredients at one stage ann all you get is a yellow liquid! And doing without olive oil is also a great tip. Bravo! hey, i really like your receipe and would like to put it in our food coop’s enews. is that ok? okay i tried to follow this recipe. Are you sure this can work without the egg? yummy yummy garlic crack! Thank you so much for the recipe! Having moved from a large city (Houston) where international foods were readily available – to a small town where you must make your own, this recipe brought back a flavor that i had given up on experiencing again anytime soon. My husband is a chef (and a chili-head) who has never tasted toum before, so it was wonderful to share this with him… he can’t wait to have company over so he can make it for them, too! I have tried to make the other garlic paste recipes and failed. I tried you and it was magnificent. Thank you do much. I love this stuff. Unbelievable. My girlfriend’s been looking for this for years and your recipe hit it dead on… We actually ended up eating about a quarter of the yield the first day. One question though, if we wanted to can it, would the emulsified mixture hold up in the heat of the canning process? OMG OMG OMG!!! First attempt, it split of course, but it is still THE MOST DELICIOUS thing I have ever tasted!!! I am going to sit here with a loaf of good bread and eat every bit of it. My grandma has a great trick to remove the potency of the garlic yet at the same time keep the delicious flavour. She puts the garlic in the freezer for about 3 days which will get rid of the hot flavour and smell but keep the creamy taste. Tip: When you are going to make toom and take it from the freezer, leave it in the sun for a while to make sure it is very dry otherwise it will split. Do not make it if the garlic is sweating. Thanks a -bunch- for this awesome recipe and the careful details included. I love this sauce SO much and I am a fiend for garlic. I order tons of this sauce every time I go out for Lebanese food. I’ve always wanted to make it at home and I’ll certainly be doing that soon with your recipe, and blogging about it with a link and credit back. Again, thanks, and love your blog! My garlic sauce emulsified, but it’s heavy. I had to cut the portions in half because otherwise I would have had WAY too much sauce. If there a way I can make it lighter? @ Elizabeth. I actually like the heavier (original) version, but it just makes way too much. He posted an updated, easier version, but you have to have a blender: http://thefoodblog.wpengine.com/2010/04/fast-and-easy-toum-the-best-lebanese-garlic-sauce-recipe.html. I added 2 tablespoons of water and it was quite light. I made toum twice, once yesterday and once today. Yesterday’s toum was made in a blender, and although I tried my best to follow your instructions, I messed up on the step when adding oil- I added all of it in a thin stream, but you had instructed to only add half, then add lemon juice, then the rest of the oil. It split, but I poured out the liquid, added another egg white and whizzed away. It resulted in the perfect texture, but I was scraping down the sides of the blender when my small spatula hit the blade and it cut a piece of plastic off. To be safe, I threw that batch out, but the flavour and texture was delicious. 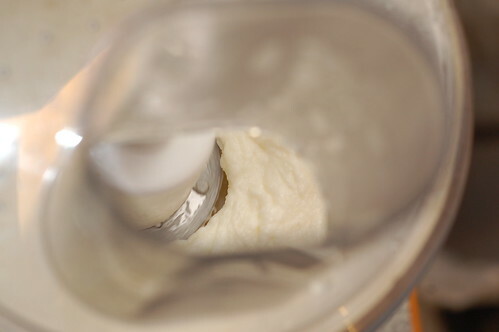 Today’s toum was made in a food processer as the blender was too messy- the liquids kept flying out of the top hole. I used the proportions in your recipe, but blended the lemon/salt/garlic first, then added the stream of oil, lemon juice, stream of oil (repeated). I guess I was trying to see if it would become thick and fluffy without having to use egg whites. In the end, the mixture did not split, but seemed too watery. I added one egg white and it thickened up the texture. I think if I added one more egg white, it’d improve the texture even more! By the way, different types of garlic (chinese, mexican, etc.) gives different strongness to the garlic flavour, and it’s better to use other types and not the chinese garlic. Thanks for the recipe and I’m finally glad I can make this now, although there’s tons of stuff to wash and clean up after, it beats paying 5CAD for the same amount when I can just whizz away with ingredients I already have on hand. But I prefer the product of the larger batch recipe. Hard to use it all though. I have a small electric chopper; I use it to chop the garlic (about one head of garlic), with the salt and about a teaspoon of the lemon juice. Then into a bowl and use the electric hand mixer (the first time I made it in a tumbler, and only used one of the beaters), add about 2 tablespoons of oil, then a few drops of lemon juice, repeat, repeat, repeat etc. It’s seems like a wonderful recipe. I wonder how much does a cup mean in your recipe. 1 cup garlic equals how much grams or kg. And same thing for oil as well? Thank u.
Ok so it turned out to be the perfect consistency but then I added too much oil because I’m a dimwit and botched it up. If I try to salvage it with egg whites, should I drain the excess oil that is floating on top before I add the egg whites, or keep it all in? OMG! I just made this and it is awesome… garlic crack!!! Thanks so very much for posting this recipe! I tried this recipe and the consistency came out great, but it’s way too salty! Is anyone else having this problem? I used the 1 tablespoon at the start as stated in the recipe but the salt now overpowers both the garlic and the lemon. I love the original recipe! I make a 32 oz jar of it and dip into when I need it! Since hubby and I are both garlic lovers I have so many uses for this recipe! Thanks so much for sharing!!! Just made this, but halved the recipe and seems to taste just fine! Do you think this recipe would work even with garlic from the refrigerator? What if I let it out of the fridge until it was room temperature? I have been making this recipe, exactly as noted for at least two years – and it’s perfect every time until very recently, when instead of emulsifying and becoming that magic, fluffy stuff, it suddenly started turning into an oily soupy mess – not emulsifying and fluffing up at all. Could it be that my food processor is dying? If it doesn’t process at enough of a speed, would that cause this to not work properly? Before I go out to buy a new unit, I could really use some advice.